Sideshow Collectibles recently announced the acquisition of the Teenage Mutant Ninja Turtles license, which we reported earlier. Now Sideshow has released a sneak peak image of their first turtle from their new up coming line for the Teenage Mutant Ninja Turtles brand. 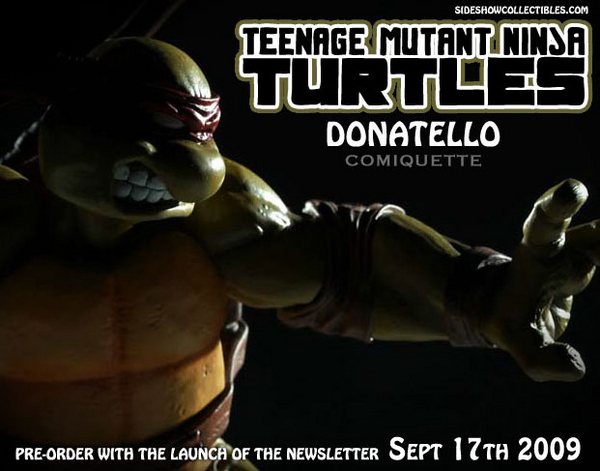 This bodacious comiquette features none other than the brainiac of the group, Donatello. Pre-Orders are available with the launch of the newsletter on September 17th. Not much shown in the picture, but what I see so far looks pretty dope.